Like many zoos and aquariums in the United States, the Louisville Zoo operates as an agency of city government. Recently, the mayor’s office in Louisville presented a strategic plan for the city and many of its divisions. In order to track the progress towards their strategic goals, the Louisville Metro government maintains a website designed to enable all citizens to track many of the City agencies online by Key Performance Indicators (KPI). This tracking includes many operational aspects of the Louisville Zoo. The Louisville Zoo’s leadership was quick to recognize the opportunity that this could present. Zoo Director John Walczak and Assistant Director Steven Taylor knew that citizens who tracked the Zoo’s KPI are also citizens who care about the zoo. 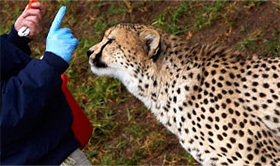 With over three quarters of a century of zoo management experience between them, Walczak and Taylor understand that regardless of the management or governance of a zoo, every community wants to be proud of the care provided to zoo animals by the dedicated, qualified, and professional staff. Ongoing staff training is a key component of the new vision for the Louisville Zoo. The San Diego Zoo Global Academy is a primary tool that will be used to help develop and recognize the professionalism of their staff. Leaders at the zoo are pushing for excellence in several key performance areas. With keepers and animals at center stage, Walczak and Taylor want their zoo guests to enjoy a family-friendly environment, have fun while learning from the staff, and enjoy compelling, behind-the-scenes glimpses of specialized animal care. Leaders at the Louisville Zoo know that once guests are engaged, they will be more open to the larger conservation messages and opportunities to support the zoo’s good work. It all begins with the staff sharing the vision, supported by opportunities for advanced professional training. 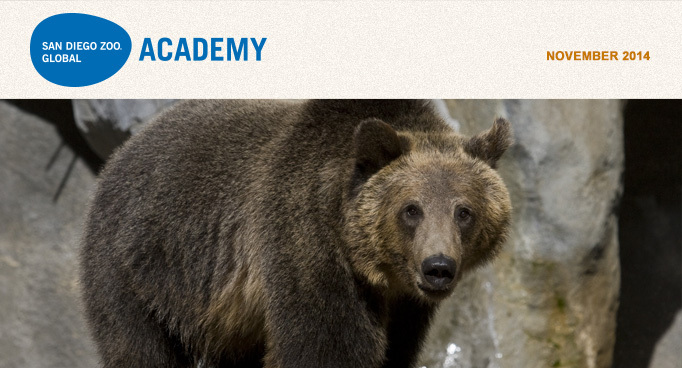 Louisville is utilizing the San Diego Zoo Global Academy to provide their animal care staff with online training in a wide variety of zoological best practices. Animal care workers will be challenged to take and pass with a 90% or better all 13 Fundamentals of Animal Care training classes in the professional certificate series. The completion of each level in the series is recognized by the award of a personalized certificate, which is co-branded by the Louisville Zoo and the San Diego Zoo Global Academy. In addition, classes on interpretation and storytelling will be important to staff as they help implement the Louisville Zoo’s vision. At any zoo or aquarium, nothing completes a guest’s visit like the opportunity to have an informed discussion with one of the keepers. The stories shared by a professional in this setting are often repeated to friends and family as the memories are shared. The Academy wishes to congratulate the staff of Louisville Zoo as they work to launch this exciting strategic plan. Two New Courses in the Introduction to Animal Species Series! Lions: Get the lowdown on lions, the regal cat known as the “king of beasts.” In the Lions module presented by San Diego Zoo Global Academy, you’ll get an in-depth look at Panthera leo and explore the natural history of this feline along with current conservation efforts. You’ll learn about the lion’s physical characteristics, habitat, behavior, reproduction, and who is working to protect these animals. Quick quiz questions at the conclusion let you assess your knowledge and build your confidence to correctly address guest questions about lions. Click here to view a sample of the new Lions course. Great Apes: Dive into the fascinating world of primates, as the San Diego Zoo Global Academy presents the new Great Apes module. Images show apes in ways you may not have seen before, and video provides insights into their behavior. The module explores the natural history and conservation of the great apes and covers a bit about primates and how the apes fit into this larger group of animals. Click here to view a sample of the new Great Apes course. The Lions and Great Apes modules join Cheetahs, Tigers, Giant Pandas, and others in the Introducing Animals series. Look for Cats and Orangutans coming soon. These modules offer informational resources not only for interpreters but also for animal keepers. Whether you’ve worked with these species for many years or you are a volunteer just getting started, you’ll gain a better understanding of these amazing animals after completing these courses. Safari West joined the Academy's collaborative learning environment! Now they will a privately branded custom site for their employees. Welcome! When I first heard about the SDZ Global Academy I was excited by what it could mean for us at Living Coast Discovery Center. Having no formal training in place for many of these topics, I immediately wanted to be a part of it so I could share what I would learn with my keepers and other team members. After hearing more about the program, I went from excited to edge-of-your-seat, sign-me-up-now excited. The topics were not only relevant to many things we do here at our facility, but they sounded like a lot of fun too! I was eager to take the courses so I would be able to improve the quality of work we were producing, which would in turn offer better care to our animals and a better experience to our guests. I couldn’t wait to get started! After having taken a few of the courses now, the Academy holds up to everything I thought it would be. The wide variety of courses are easy to follow, with lots of interactive material including videos and activities, so time just flies by when I am taking one. I couldn’t be happier with the program, so I’m looking forward to continuing the journey and learning more with each course I take! Is harassment training mandatory for your supervisors? If so, your Academy subscription comes with a web-based solution that complies with California’s state law and meets their requirements. The state requires that the course be a minimum of two hours in length, must be interactive, and be taken every two years. The course provided in the Academy is titled Harassment Prevention Training. This course provides comprehensive, online training to prevent harassment in the workplace. It offers strategies to achieve more appropriate employee conduct and reduce your company’s liability. In addition to promoting a harassment-free work environment, this course could bring your organization into compliance with state laws, such as California's sexual harassment training requirement, AB 1825. At San Diego Zoo Global, we are getting ready to train 300+ managers in the month of December to meet our state training requirement. Previously, the training was presented in person by our Chief Human Resources Officer and our Human Resources directors, but now we are very excited to be able to provide this training online. The web-based program also provides electronic reporting functionality. Have an eBook, course catalog, handbook, video, or slideshow you want to share with your volunteers that's too big to send via e-mail? Place it in the main resources section of your Volunteer Connection site. Feature the document for the duration of time you want it highlighted and easily accessible. If it's over 8 MB you can place it in DropBox and post the public link to it on your Volunteer Connection site. Your volunteers will have easy access to it 24/7. Hopefully most of you are aware of the wonderful resource that we have available to us in the DIY. DIY stands for Do It Yourself and is a course creation tool. I found DIY particularly helpful earlier this year when I rolled out a Heat Illness Awareness course. OSHA made this a mandatory training topic for any workers subject to outdoor temperatures in excess of 90 degrees (and recently amended to 85). There are plenty of presentations available, but all require a person to show the slide show and interpret or narrate the information. I customized our own presentation, uploaded it into the DIY platform, and then recorded an audio track for each “slide.” The great thing about the DIY is that it ensures that each and every employee receives the exact same message and learning and is not subject to the presenters' independent knowledge of the subject matter or interpretation. At the end, a 10-question quiz was added and a certificate option selected. The class is then published and will appear in the DIY section of the course catalog. I now have a course available to all users that has all class data saved in the learning management system for reporting purposes.